I've been trying to find out what is happening with my many family and friends on the American east coast. Some people have made contact by plugging their smartphones into the car's power supply, because their homes no longer have any. The following pictures were sent by one. That fallen tree reminds me that another New Yorker wrote in that she managed to get a last minute "tree pruning" just before Sandy hit. That saved them. Here in the HolyLand, winter is entering more gently with the winter crocus and olives ripe for the picking. That's the way it should be. Should Americans take it as a wake-up call that G-d sent the hurricane just before Presidential elections? Well, you'd have to have a strong belief in G-d or god for that. It's over forty years since I made the big move from Long Island, New York to Israel and over thirty years since we moved to Shiloh. Maybe my memory is faulty, but I don't remember any storms, hurricanes like that in the score years I had lived in New York. In my memory, hurricanes and Florida were connected. We had some thunderstorms in the 1950's and 1960's, but we never lost electricity, except for that big blackout in the mid-1960's. Only after I moved to Israel did my parents suffer the flooding in the house that required a special pump. Major precipitation was mostly the March blizzards, which were fun for kids, since school would be closed and we'd be able to play in the pristine snow until it was slushy and melted enough for transportation to return to normal. Hurricanes and ice storms were unknown to New Yorkers. Chazal, our Torah sages, teach us that the weather in the Land of Israel is connected to how well we obey G-d's commandments. Does this apply to the weather all over the world? I can't say for sure. My understanding is that the Laws of Nature are for the rest of the world, and the Laws of G-d rule here in Eretz Yisrael. If that's the case then there really is some human cause to the changes in the weather throughout the world. If so, it's connected to evolution of sorts. Yes, evolution happens, even if you count the world as we know it as being 5773 years old, the year we have on the Jewish Calendar. And remember that G-d does control life and death wherever and whoever you are. You can't just opt out of His Power by not believing in Him. This is the world, the cooperation, tolerance, coexistence etc that the international (and Israeli) Left-controlled media doesn't like to show. Remember that the Arabs who shop in Yafiz and Rami Levy do it for neither sentiment nor ideology. When you enter our world, you enter one that the "experts," the Leftist academics, ideologues, diplomats, journalists refuse to recognize. The only places where Jews and Arabs can safely work and mingle are in places like Rami Levy and Yafiz, Sha'ar Binyamin. The Arabs wouldn't be bringing their children and babies to treat them to fancy holiday clothes if they didn't like the quality, prices and atmosphere. They wouldn't be bringing their visiting family and friends from various Arab countries on shopping sprees if the price and ambiance weren't right. In all honesty, I work in a world I had no idea existed. When agreed to work in Yafiz, Sha'ar Binyamin, this aspect wasn't even mentioned. And as I approach my two year anniversary working there, I must say that there has definitely been an increase in Arab customers. The other day one told me that he's buying a lot for his children, because the stores in Shechem aka Nabulus triple their prices before the holidays. Unlike most of the Israeli Leftist "coexistence groups," there's no condescending here. A customer is a customer. I think that paying too much attention to those political polls can be very dangerous. It's like checking the ground, so you won't trip and then getting hit by a low branch or shelf, or checking for a branch or shelf and falling off of a cliff. I'm a big picture person. And my ideas are frequently out of the box. That means that you may not read or hear anyone else saying/writing the same as me. Here in Israel, you'd think there's a chemistry experiment/contest going on with every single possible political alignment being polled and calculated as if they're trying to find a cure for cancer. In Israel the big picture means that the government should be framed by equally strong opposition factions/parties. This has not been the case for decades, ever since Menachem Begin's Likud got into power in 1977. There was a time in the 1980's when the Techiya Party was in the opposition on the Right and there was also a Left opposition. That was good. But then Techiya joined the government with the Likud when Yitzchak Shamir was Prime Minister. That was the end of Techiya. It didn't get enough votes to make it into the Knesset in the following elections. Since then, the Likud has been moving Left, since it doesn't fear any party from the Right. When Prime Minister Binyamin Netanyahu made his coalition, he got Avigdor Lieberman to join it, which has kept Lieberman on a leash which Bibi lengthens whenever he needs something strong said that doesn't suit the image he likes to show. Now, most probably since neither Ehud Barak (formerly Labor) nor Shaul Mofaz (Kadima) don't have much vote-getting power, he has successfully courted Lieberman to run their parties together in the next elections. Lieberman garnered a lot of votes in the last elections because he campaigned strongly to the Right, but now after being in the government, Right voters won't fall for him again. NRP is trying to campaign as a Right party, but since it's comfortably in the government and enjoys ministerial perks, Israeli Right wing voters are wasting their vote to vote for them. There is no longer a National Union Party since Ketzele ran back home to the NRP. MK's Drs. Arye Eldad and Michael Ben-Ari must run a strong campaign to show that they are the only party that will not compromise principles for "Volvos," aka being a government minister. Even extreme Left anti-religious Tommy Lapid's son Yair is trying to show that he's isn't anti-religious nor anti-Jews in the Land of Israel by campaigning in Ariel and having Rabbi Shai Piron of Tzohar as his number 2. The smart politicians are trying to get the votes from the Right, and that means that properly presented, there can be a strong viable Right wing party in the opposition. Netanyahu's Likud actually needs a strong Right opposition to show that he's not a Right wing extremist. If Likud is the party most to the Right it would be bad for them. Vote for the Eldad-BenAri Party, HaTikva, Hope! No doubt, some of you like those who keep up with Jewish Israel know the place. This is a Messianic Christian faux Tallit. These are "Christians" who refer to themselves as "messianic Jews". They use Jewish rituals and traditions to dress up their belief in Jesus. By feigning Judaism, messianic Christians hope to blur the lines and break down the theological wall between Judaism and Christianity so that there will be one religion under jesus. It’s important to let your readership know that the fish/menorah/star of David symbol (see attached) is a messianic Christian symbol. The fish symbol, like the cross, is a Christian icon. Many Jews are unaware of this and mistakenly purchase these items in "Judaica" stores - thinking it is a "good eye" or "fertility sign". Wearing or hanging this icon in one's home would be the equivalent to displaying a Christian cross. Yes, there are many of this sect/religion in Israel and they try to pass as Jews to trick and proselytize Jews. One must be very careful. It can be confusing, because they frequently dress like Torah observant Jews. I once even found myself giving a tour to a group of them at Tel Shiloh. I was totally confused by the Tel's description of "Christian Zionists" and the very Jewish dress of the participants until I realized the truth about them. Belief in jesus is not Jewish. We Jews only believe in G-d as a G-d.
That's what my husband asked me when I spoke to him last night at work. I had been in Jerusalem since early morning checking out possibilities for a new washing machine, then met his visiting cousin for lunch and then I had to run/rush to work in Sha'ar Binyamin. Since I have neither a laptop computer, ipad, "kindle" nor a smartphone, I'm pretty ignorant of anything going on when not home, unless it happens right where I am. And nowadays the buses don't have the radio on with news reports every few minutes. Actually, after the first "huh" I wasn't surprised about hearing that Prime Minister Binyamin Netanyahu and Foreign Minister Avigdor Lieberman are combining their political parties, forces and futures. Both are extremely intelligent, pragmatic politicians. There are former Likud members in Lieberman's Yisrael Beiteinu (Israel is Our Home) party. So, Bibi's aim to get former Likudniks, most notably Uzi Landau, to return "home" to the Likud, which has been more publicly focused on Kadima, hit the bulls-eye when he changed targets. Similar to Bibi's short-lived "marriage" with Shaul Mofaz of Kadima, this match/merge took people by surprise. Considering how the media is trying to broker, encourage the Israeli Left, Kadima, Labor, Lapid, Olmert etc to merge as a counter to Likud, it's rather interesting that Netanyahu and Lieberman didn't need that sort of help. No doubt that this is a sign of leadership versus mindless nebichness aka incompetence of the Left. As a student of the Bible, I see those Leftists as more like a King Saul figure, who had to be led around by his servant and eventually was deposed by G-d because every time he made a policy decision on his own it was the wrong one. Samuel The Prophet finally gave up and retired after appointing David to replace Saul as king of the Jewish People. David was in direct communication with G-d. I've been taking Bible classes on that very subject of King Saul, Samuel the Prophet and King David at Matan taught by Dr. Yael Ziegler. There's a big question here in terms of real policy and the Likud in general. Netanyahu has shown himself to be a master at controlling the Likud's internal departments. It's hard to forget how he played around with the primary results just before the most recent elections to make sure that Moshe Feiglin and others more to the Right wouldn't make it into the Knesset. During that campaign I had no doubt that Lieberman did well, because he campaigned uncompromisingly Right. Will Bibi and Lieberman play "good cop, bad cop," one aiming for Center voters and the other out to attract the Right? Lieberman is as wily as Bibi, and it's hard to know what he really stands for, but that's for another post. The big loser will be the only truly Right party on the Israeli political spectrum, that's the one led by Dr. Arye Eldad and Dr. Michael Ben-Ari. The question is whether they'll be able to effectively promote my idea of the importance of parliamentary and ideological opposition in Israeli Government. Those Israelis who ignore the fact that the Israeli south is under attack by Gazan Arab terrorists must be neurologically impaired. We are all one nation and one country. If you can't feel the pain and panic and destruction, then it's as if your nerves are blocked. Sharon Katz of Voices Magazine expressed it perfectly in her post, I am from the South. Sharon and I have some good friends who live in the Negev and keep us updated with reports and pictures. Isn't that what facebook was really invented for? Dozens and dozens and dozens more of deadly missiles have been launched against Israel by the Arab terrorists. All the Israeli Government keeps saying is that they'll do some "cosmetic surgery" on the buildings in the south to "protect" people. Nu, that won't really help; it won't stop the attacks. It'll just make them try harder. It's like "protecting yourself" from a dog attack by trying to kick it. The dog will only get more aggressive. From what I've read, that Iron Dome only intercepted about 10% of the missiles, seven out of sixty-nine, according to the Israel Hayom article. And who knows how long and how effective the cease fire will be. Been there, done that. They only last long enough for the Arab terrorists to re-arm. A word to the wise, please don't rely on the big international news sites like CNN, because you won't get the news there. Please excuse me for not saying good morning, I feel ill...yesterday my neighbours were bombarded with 80 plus missiles. People were injured some badly some lightly. Families lost their homes and what did my government do...not end the terror but as cowards agreed to some Egyptian led cease fire... I want to scream! ...you asked about Ashdod. My son said all they are firing are short range kassams and mortars. To reach Beer Sheva, Netivot, Ma'agalim, Ashdod and anywhere else they need to use long range Grads. They know if they shoot 30 Grads we will go to war. Tomorrow starts a 4 day chag (holiday) for them and they don't want a war. for D's kids their school is totally fortified...but the road the bus needs to take to get them from home to school is very, very dangerous... Most area schools are not totally fortified and all it would take is one panicked child to set everyone off... You need to be a Solomon to solve this problem..
...just about 2 years ago a bus was hit by a kassam on the road that 5 of my kids travel on. One of the boys on the bus was killed. Who will take the chance of a repeat? My brother-in-law is a garbage man. He works in rain, blazing sun, freezing cold, hail and KASSAM ATTACKS. He was just here and told me that this morning he was in Kfar Maimon (where my kids go to school) & a kassam landed about 150 meters from him. There is no place to hide, all you can do is pray. The garbage truck has some small holes from shrapnel but B-H he is PHYSICALLY fine. Real people with real families live under constant attack. We need to destroy the terrorists!!! That's the only solution!!!! I work in Yafiz, the clothing store of Rami Levy in Sha'ar Binyamin. This morning our little island of peace and cooperation was defiled. A gang of anti-Israel terrorists, backed by their own professional publicity team, invaded Rami Levy in Sha'ar Binyamin. OK, before you die of curiosity; I wasn't there. I don't work full-time. In the past I've blogged about the warm, peaceful relations between Jewish and Arab, workers and customers. I don't think any of us working there took jobs for that sort of political or ideological reason. We work there because we need the money and the location is near home. Jews and Arabs shop there, because the price, location and products are good. Most people are pragmatists. I've experienced Arabs from Ramalla, Shechem and various villages shake my hands and even some women hug me to thank me for serving them and helping them find just what they needed. A couple of weeks ago, one woman from a large Arab city told me that she enjoyed practicing her English with me. She's an English Teacher and insisted that I'd make good money teaching English in Arab universities in Jenin or "Nabulus." That really threw me. Could she really be unaware that I'm Jewish and wouldn't be safe nor accepted in those places? Seriously, that's how comfortable and accepted our Arab customers feel. It's obvious that the Leftist extremists and anarchists from Israel and abroad are very unhappy that there is peaceful coexistence in places like Sha'ar Binyamin. It's obvious that they are against peace. They don't want Jews and Arabs to get along, especially when the Jews are people like me, proud, religious and Right. The success of stores and shopping areas like Rami Levy in Sha'ar Binyamin threatens the false image the Leftists try to promote. The truth is that Left wing ideology is anti-peace and anti-security and stability. Israel's media has always been extremely Leftist and anti-Right, Revisionist, Cherut, Likud etc. All of Israel was like that from the big bosses on down, except for the ordinary man in the street. Yesterday I had a ride with a neighbor who's a relative of one of Israel's first popular Eidot Mizrach, North African/Sefardi politicians, a Likudnik of course. His father was a local labor leader, head of his workers' committee, who categorically refused to be associated with the Histadrut, the powerful Israeli Labor union. Most aspects of life here in Israel have opened up for those who aren't Histadrut and Labor members, but the Left's last hold-out is the media. They may have stopped worshipping Stalin, but they're willing to try anything or anyone against the Likud. Binyamin Netanyahu gives them nightmares. OK, as you all must know by now, for me, Bibi is too Leftist, but for the mehadrin Left of the Israeli political scene, he's there worst dream come true. at a government meeting in 2008. If the center and the left together could garner 61 seats, it would deprive Netanyahu of the ability to form a majority government. Another of their "tricks" is to promote American style debates between Netanyahu and the wannabes. This may sound acceptable at first, but there are two crucial problems with it. One is that in Israel you don't vote for a Prime Minister. You vote for a political party and its list of candidates to be MK's, Members of Knesset, Israel's Parliament. After the votes are counted, the #1 spot of the party with the most seats is offered the challenge of constructing a coalition by the President, of Israel of course. If he or she succeeds, there is a government. The second problem is that none of the other touted debate participants head a party that comes close to rivalling the size of the Likud. It would almost be as if one of the small, oddball independent candidates in the States would have had been invited to join the debate against Obama and Romney. If Netanyahu has inherited any of his father's longevity, he'll be around for a very long time, which is a terrible nightmare for the Left in Israel. The media's machinations will only make a difference if the Israeli public becomes as ignorant as the American one, as seen in this article. Yes, it's in the title, and I'm sure I'm not the only English/language/literature teacher to have done my best to train my students to always first read and understand the title. Both Mitt Romney and Barack Hussein Obama pledged to "stand by" or "stand with Israel if attacked." I know they both meant well in their ways. But none of their words made me feel reassured. First of all, we all know that they mean it figuratively, not literally. That means that they'll do nothing to prevent an attack. They wouldn't endanger American lives. Obama at a different point in the debate said that instead of concentrating on policing the world he wants to concentrate on "rebuilding America." We all know that when push comes to shove, if Israel would G-d forbid be attacked, it would be standing alone. No Americans government or military would come here to fight and absorb the blows, the missiles nor the bullets. I don't expect them to do. I see them as an audience tsk, tsking away. The only reassuring thing about all the mention of Israel is that both candidates wanted to give the impression that Israel is important to them. Considering how small our country is and how few Jews there are in the United States, you really have to be impressed by the focus on Israel by both Obama and Romney. I suggest you read Ruthie Blum's Israel HaYom article about the debate. She makes some very important points. The most blatant example of this during the debate was Obama's claims that he was tough on the Iranian regime and its race for nuclear weapons. Listening to the appeasement king of the West assert that he laid down the law to the mullahs from the get-go, that his sanctions have been working, and that he will never allow Tehran to proceed toward completing the bomb, one might conceivably be lulled into forgetting what he has been up to. Romney did make an attempt to counter Obama’s claims here, by reminding viewers that Obama had abandoned the Iranian revolutionaries when they tried to topple President Mahmoud Ahmadinejad and his ayatollahs. But the Republican contender had neither the time nor the tactical approach that would allow for throwing the president’s bald-faced prevarications in his face. There's something very frightening in the entire American electoral system. That's the ignorance of the voters. Democracy is a very dangerous business. Obama's "Romnesia" Line, Like a 4 year old Calling Someone "Doodoo"
There's an inherent immaturity in the entire Obama campaign for another chance to fix America and his calling Mitt Romney "Romnesia." Obama new "stump" speech was well-written and gets lots of cheers, but he'd be cheered just for burping, too. I find those signs stating "FORWARD" rather ironic, considering that Barack Hussein Obama is the sitting President of the United States. I have no doubt that the placing of all the young women standing behind him, black and white, though not Asian as far as I can see, was planned, too. It's seems like Obama was at a great advantage because of his horrendous performance at the first debate. He could only go up and one of the polling questions is "better than expectations"
A CNN poll of registered voters who watched the debate found that 48 percent said that President Barack Obama won the debate and 40 percent said Mitt Romney did. Registered voters in the CNN poll were more likely to say Obama outperformed their expectations than Romney did, perhaps reflecting expectations set by Obama's poor performance in the first debate. Fifty-nine percent of respondents said Obama performed better than expected, 15 percent worse than expected, and 23 percent said he performed the same as expected. Romney outperformed the expectations of fewer respondents: 44 percent said he did better, 26 percent worse, and 26 percent the same as they expected. The key to effective teaching is homogeneous rather than heterogeneous classes. If the students are of similar intelligence and success levels it's much easier for them to learn and easier for teachers to teach. I was in over-crowded 40-plus classes in elementary school and we all did fine, because we learned at the same rapid pace. The children who needed more attention and help were in smaller classes. You can't give all kids the same class size for a good education. A dozen kids in the class on different levels will demand a dozen lesson plans. Romney was right to point out that Obama was wrong to nudge Egyptian President Hosni Mubarak out of office when the president must have known that the anti-Israel and anti-American Muslim Brotherhood would move in. Obama countered, "In Egypt, we stood on the side of democracy." Alas, the Muslim Brotherhood doesn't stand on the side of democracy. I'm glad that the American Elections will be over a couple of months before the Israeli ones. American Elections are a "one ring" circus, while Israeli elections have multiple rings. Yesterday I was home in time to watch the news and wish I hadn't. It was awful. That's not because of objective reasons that things are so terrible in the State of Israel. It was because the news was so unprofessionally blatantly anti-government and even anti-state. The concept of objective news reporting just doesn't exist in Israeli culture. The writers of the show and the directors make sure that the government, that is Likud Binyamin Netanyahu's government looks as bad as possible to help promote, campaign for their buddy Shelly Yachimovitch of the Israeli Labor Party. "Don't buy food out of season. Tomatoes are a summer crop and cabbage is for winter." I was horrified that the Israeli anti-Israel extreme Left anarchists, who had been on the faux human rights Estelle, were featured, full venom and lies, on Israeli television. They should have had been kept totally incommunicado. Instead we saw and heard them smiling and smirking as they spouted their anti-Israel rhetoric and lies on Israel's Chanel 1. The news is in Hebrew. I don't know how well it will work if you click. Watch 7:33 for that immature Obama Romnesia remark and 13:18 food prices and 16:40 the extreme-Leftist who had been on the Estelle. Another big problem is that the interviewers interrupt and verbally attack anyone they don't agree with. Only the Leftists and anti-government interviewees, the more extreme the better, are allowed to give complete answers. And shades of that movie classic "War of the Worlds" panic, the "nationwide" earthquake drill in Israel was broadcast on the news as if it had really happened. I was at work in Sha'ar Binyamin most of the day, and we didn't participate in the drill at all. All those faux human rights groups bankrolling and supporting "humanitarian aid ships" to Gaza are just anti-Israel pro-terrorist fronts. Not for the first time, in an act of self-protection, Israel has been forced to stop, board and inspect a publicity act ship which had been on its way to supposedly help the Gazans. The funders and backers of that ship claim they are bringing "humanitarian aid" to the Gazans, but that's not what they were bringing. It's all part of a very photogenic anti-Israel publicity campaign. Prime Minister Benjamin Netanyahu praised the IDF on Saturday for its takeover of a Gaza-bound ship carrying pro-Palestinian activists. He said the Estelle ship’s passengers aimed only to provoke, and to slander Israel. First of all, Gaza is not suffering. There's plenty of food, medical supplies etc. And the Gazans aren't some innocent bystanders in the "Mid-east conflict." The Gazans are the aggressors who have been attacking innocent Israelis for years. Why aren't those "human rights activists" bringing gifts and supplies to cheer up the residents of Israel's Negev? And as Prime Minister Binyamin Netanyahu suggested, Syrians are suffering a lot more than anyone else, though it's the Syrian civil war that is at fault. No doubt that the extreme Leftists who tout the mantra of "human rights" don't have the guts to get to the places and help the people who really need help, like in Syria. There's a very violent civil war going on there and no doubt that if they'd approach a Syrian port they'd be attacked, really attacked. It's so much easier for the world to accuse Israel of human rights violations, because Israelis are humanitarians who bend over backwards endangering ourselves to help others. Caroline Glick's Latma just keeps on getting better and better. In all honesty, it can't be all that hard, considering the political scene here in Israel. No surprise that this week's broadcast concentrates on the upcoming elections both in Israel and in the United States. This week Latma's Tribal Update presents Freddy Spin's electoral politics, Elhanan's hard night with a late night caller, Obama's advisor helps us to understand how the president feels towards Israel. I wish Likud MK Tzipi Hotovely would leave the Likud and join with MK's Arye Eldad and Michael Ben-Ari. In terms of basic ideology she has more in common with them than with Prime Minister Binyamin Netanyahu who rules the Likud like a strong, wily dictator. Hotovely has been saying the right things and wants the cabinet ministers to make the government discuss the Levi Report which admits that we Jews have all legal rights to live and build in Judea and Samaria. The Levy Report concluded that there is no “occupation” and international law allows Jews to live in Judea and Samaria, as its status was not that of a nation in 1967. She, like many Israelis, doesn't understand that an opposition MK has more independent power than a government minister. The Levy Report was presented a few months ago, and since then Centrist PM Binyamin Netanyahu has preferred to keep in hidden from the public, since it doesn't suit his ideology. Hotovely is young and still makes idealistic statements, but she should have learned the way politics works by now. The real power to move and change the people comes from the opposition. That's something the Left has realized. Israel's faux "social justice" protest movement from the summer before this one, had always seemed to be professionally organized. And it's no surprise that the leaders are joining Labor Party. In a move that could have a significant influence on younger voters, a prominent leader of the social protest movement and National Student Union chairman, Itzik Shmuli, announced that he will be joining the Labor Party and running in its primaries ahead of the coming elections. The Left's biggest problem in winning elections is simple demographics. Small families make fewer voters. Otherwise they'd be in power. The Israeli media has been extreme Left forever. One of the reasons many of us blog is to give us editorial independence. Politicians on the Right must be willing to be in the opposition to also be independent, say what they want and mean and influence the future of the State of Israel. I stay far away from the NRP, because the NRP wants to be in the cabinet, and the cabinet ministers are required to follow the government's line. Unlike the rather boring American political scene which has had the same two main parties for about two hundred years, you need new scorecards for each Israeli Knesset Elections. Not only do political parties come and go and reinvent themselves with new monikers, politicians and wannabees keep switching partners like in a wild folk dance. The Likud is again changing its rules. Last time it changed them post-primaries, so I guess Bibi wants to look more honest so he's trying to prepare the party to give himself some needed "flexibility" to bring in people he wants in the Knesset. Last night as I was trying to fall asleep, I kept hearing about the Shas "celebrations" since the disgraced, former prisoner, Arye Deri seems to be back in politics. According to sources close to the housing minister, Yosef asked Attias last week to broker a deal between Deri and Yishai in order to bring a semblance of unity back to the party. Despite the agreement, Shas insiders believe it will be hard for Yishai and Deri to work together, with Deri’s political cunning and charisma likely to overshadow the more staid character of the present interior minister. Deri served 22 months of a three-year jail term from 2000 to 2002 for accepting bribes from the Lev Banim Yeshiva during his tenure as director-general of the Interior Ministry and then as interior minister. Anyone convicted of a crime involving moral turpitude – as Deri was – is banned from running for Knesset for a period of seven years following their release from prison. The coming elections are therefore the first for which Deri is able to run since his release, despite unsuccessful attempts that were made for him to run in the 2009 elections. An old youtube interview with extreme Leftist Uri Avneri is making the rounds. In it Avneri claims credit for mentoring Arye Deri into politics. According to Avneri, Deri is if anything more extreme Left than himself. On the ki'ilu sort of or fake Right, the NRP aka Jewish Home Party is getting lots of publicity, because it's planning primaries and has some media savvy candidates in competition for leadership and Knesset seats. I see the NRP as Likud with kippa and tzitzit. Push comes to shove, they want cabinet seats and Center policies. On the Left, Kadima is sinking. It's no real surprise. Its comatose founder, Ariel Sharon, is showing more "life" and permanence than the Kadima Party. With the National Union breaking up, Ketzele and Uri Ariel are returning home to the Mafdal--National Religious Party, I'm sticking with MK's Arye Eldad and Michael Ben-Ari. As I've written many times before, the only way to keep the Likud from going totally Left is to have a strong Right opposition. That means that we should not vote for any party that plans on dreams about having cabinet portfolios. Never dull. What do you think of the campaign as it heats up? With two big elections in the near future, The United States and the state of Israel, this is a real fun time for political pundits. moderated by CNN's Candy Crowley. See the best photos of the first presidential debate. While most of the world is concentrating on the second American Presidential debate between US President Barack Hussein Obama and Mitt Romney that took place a short time ago, my mind, heart and body are here in Israel wondering what will be with our upcoming elections. The Israeli political system is very different from the American one. We don't have a presidential system. We don't vote for our Prime Minister. We vote for a list of potential Knesset candidates. The largest, or strongest party's leader is then given the chance to form a coalition and if successful become Prime Minister. Most politicians want to be in the coalition and they want to be cabinet ministers or Vice/Assistant Sgan Ministers. The possible Prime Minister uses that to cement (bribe) the politicians to be loyal to the government. If the cabinet ministers don't toe the line, then they lose their perks and positions. Basically they become well-paid "yes men." There really isn't all that much power in being a minister, certainly not in the position of Sar Bli Tik, Minister Without Portfolio. Just like in the classic comedy "Yes, Minister," most of the work of the ministry is by civil servants who, unlike the minister, has this government job that they keep until retirement. I prefer voting for a political party with principles, not dreams of being "in the government." That means that I'm sticking with MK's Arie Eldad and Michael Ben-Ari who are leaving the National Union, since Ketzele prefers his NRP buddies and a chance at a cabinet seat. I also don't think political parties should be religious enclaves. If I was a full-time, resident American, instead of an expatriate, I'd be pretty nervous about having a President who needs so much prepping before a debate. 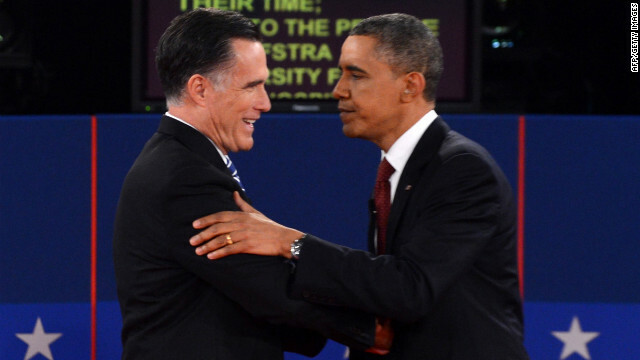 ...the history that dominated his presidential study sessions was of a far more recent kind: how not to repeat the mistakes he made at his first debate with Mitt Romney a week and a half ago, when he stood by passively as an aggressive Mr. Romney dominated him, abruptly curtailing Mr. Obama’s momentum and turning the campaign upside down. The president and his aides were clearly taking debate prep far more seriously this time around. You'd think that a trained lawyer and former legislator would have basic debating skills and would be quick enough on his feet to know how to give the impression of easy and fluent replies to all sorts of questions. Yes, it's expected for the two candidates to practice, with staff that will try to guess the possible quips accusations and statements of the opponent. They'll try to be prepared with replies to counter whatever is said against them. Obama honed his debating skills at a Williamsburg, Va., resort over the weekend with message guru David Axelrod and Sen. John Kerry — who plays Romney in practice drills. There are basic debating, public speaking, off the cuff skills that just can't be learned in a short time. It seems like American voters, especially those who voted Democratic Party four years ago, are starting to realize that Barack Hussein Obama isn't the great speaker they had believed he was. Anyone who can't hold his own in a debate isn't much of an orator. And if he can't memorize his speeches and needs the help of a teleprompter, he is in really bad shape. No doubt, Americans have been suckered. Well, elections are just in a few weeks. There is another candidate; his name is Mitt Romney who has much more experience in all sorts of fields than the sitting President. Here are a couple of glimpses of real life here in Israel. First there's the video of Arabs and Leftists faking evidence of Jewish destruction of olive trees. The Arabs and the leftist extremist who were caught on video were sawing through the trunks and branches and leaving them near the cut off trunks in an area near the Elon Moreh’s homes, as well as in another location near the entrance to the community. Council volunteers photographed them in the act and called the police. Jews do not do such things. And here is Miriam's post about living under fire in Israel's Negev region. Children are afraid to play outside, go to school and go to sleep. They are afraid a missile will hit them and they will die or their family will die. The elderly are suffering from fear...fear that they can’t get to the safe room on time. Depression among citizens is very high. Enjoying a Shabbat meal or going for a Shabbat walk is something we can’t take for granted. A siren can sound at any time. The situation is impossible, residents are told not to leave their shelters. Over a million Israeli citizens are held hostage! The Israeli Government keeps on claiming that it's enough to have the Iron Dome catch/destroy the deadly missiles the Arab terrorists launch at Israel. On occasion, Israel retaliates, but it's like trying to stop a swarm of bees wit a small flyswatter. I had first learned that there were Jews in Ethiopia before my own aliyah from New York in 1970. Somehow there were Ethiopian Jews in New York during the 1960's, and Sybil (Kaufman) Kaplan led their Israeli dance group, Tza'ad Rishon. A few months ago, I received a book to review, On Wings of Eagles-The Secret Operation of the Ethiopian Exodus by Micha Feldmann, Publisher: Gefen Publishing House. It took me a while to find the time to read it. I finally read it during the Jewish Holidays, and I'm glad I did. Feldmann has compiled (and no doubt) edited the diaries he kept during the decade he worked for Ethiopian aliyah as his Jewish Agency job and later on as part of the Israeli Embassy staff. During parts of that time, he was living in Ethiopia, while his family stayed in Israel. At no time was this an easy job. Conditions were harsh. Feldmann had to deal with horrendously difficult logistics within Ethiopia and an uncomprehending Israeli reality, too. A few years ago I taught a group of Ethiopian high school students who all used their Ethiopian names. Those names were totally unpronounceable and forgettable for me. I tried to convince the group's coordinator that it would be much better for the girls' successful absorption in Israel if they could each choose an Israeli name. I myself had done that. My name "Batya" just sort of "came out" when I was introducing myself at my first Betar meeting. My Jewish name, Baile Rochel, just didn't seem suitably Zionist; I use it for my humorous articles. And my husband had started writing under the name "Yisrael Medad" for Betar before we had even met, so Medad was the obvious name to legally replace Winkelman, less than three years after our aliyah. Considering that we had legally changed our names and are happy we had done so, I didn't think my suggestion to be problematic. But Feldmann is one of those who is in favor of the Ethiopians keeping their old names. He explains why in the book, but I will always disagree on it. I think that names are very important for first impressions. One can be very creative in terms of Hebrew names, by choosing one that means something linguistically, sound-wise or Biblical character or place. Choosing from the same "pool of names" is related to various Jewish "eidot," galut-based Jewish cultures intermarrying and melting into one people. We must all unite as One Jewish People and not keep separate. By perpetuating the old foreign names, we delay this important step towards Redemption. I also don't like the Israeli Chabad custom of giving Yiddish names instead of Hebrew ones. One of the things I do like about Feldmann's book is his honesty, the fact that he describes, admits emotions and feelings, even the negative. It's obvious that he sincerely loves the Ethiopian Jews and was willing to do everything possible, even at the risk of his own safety to facilitate their aliyah to Israel. For Feldmann, each of the immigrants and potential immigrants is a person, not just a number or anonymous file. This is rare in an operation of such magnitude and difficulty. Feldmann's story predates my daughters' experiences with Ethiopian immigrants, since he was involved with them while they attempted to get to Israel by trekking and being smuggled via the Sudan and various transit stations there and in other countries, since there wasn't any direct route feasible from their outlying villages in Ethiopia to Israel. The percentage of Ethiopian Jews who died on the way or while waiting in transit camps was extremely, tragically high. You can feel Feldmann's pain as he writes of it in his diary. 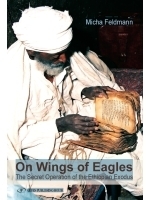 On Wings of Eagles-The Secret Operation of the Ethiopian Exodus by Micha Feldmann is definitely a book worth reading. As someone who works with Arabs, sells to Arabs for almost two years, this article that I just received from a friend doesn't surprise me as much as it would have before. Considering how rare it is to read/hear common sense in the Israeli media, I was pleasantly surprised to read such common sense in the Arab media. When I replied to my friend to thank her, I wondered "out loud" about the future of the writer. "I hope they don't kill him." OK, enough with the suspense. Arab Spring and the Israeli enemy by Abdulateef Al-Mulhim is a very thoughtful article in the "Arab News," which is a Saudi Arabian news site. The basic theme of Abdulateef Al-Mulhim's article is that although Israel is always considered the worst enemy of the Arab world, more deaths and cruelty to Arabs is by their fellow Arabs. Remember that Al-Mulhim is only one voice among a total population of 400 million Arabs, Wikipedia's count. So, this article doesn't mean that peace is around the corner. It's more accurate to say that it's still very lost in an enormous maze. 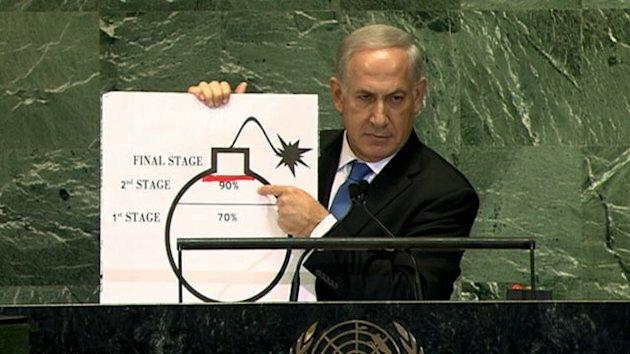 There's a photoshopped version of Israeli Prime Minister Binyamin Netanyahu's very effective visual aid from his recent United Nations General Assembly speech which is traveling around the internet, with lots of stops in facebook land. For Israelis in the Negev, especially the Sderot and Netivot area, this hits hard. It's just too true that most Israelis don't care and don't have close friends and family there. This "not my neighborhood, so it doesn't matter" attitude is similar to what the typical Leftist Tel Aviv and suburbs and even some from the north and south were saying when Jews in Judea and Samaria (my part of Israel) were being attacked by Arab terrorists. "If you want to be safe, then don't live in the shtachim (territories.)" "This isn't the shtachim (territories.)" As I've always said, if we're not safe, then nobody is. And don't forget that the Arabs are asking for Jaffo (Tel Aviv), Haifa and Jerusalem, not for Shiloh. It wasn't all that long ago when it was Israel's north that was being attacked by neighboring Arabs, and the people of Kiryat Shemoneh and environs complained, just like Israelis in the Negev today, that "nobody cares." I see us all as Israelis, Jews living in the Land of Israel, whether the Golan, Jordan Valley, Sderot, Hebron or Tel Aviv as the same. This is our Land and we must live in all of it. I abhor the media's cliche, 'Thank G-d, (my addition) no injuries were sustained in this attack.' How can anyone say that? My poor bride fund helped marry off two sisters this year. Their Mom, a mere 52, is hospitalized at the local geriatric hospital and will remain there for the rest of her life. Apparently this lady was a powerhouse when younger. However, she refused to change her eating habits when diagnosed with type 2 diabetes. Sadly, this led to her becoming totally blind and severely depressed. The straw that broke the camel's back occurred during the Cast Lead war. A grad missile landed not far from her home and the media joyfully announced that 'no injuries were reported!' However whatever hold on sanity this lady still retained disappeared as the smoke from the rocket evaporated. She is totally insane today, blind as a bat and in a wheelchair. Another woman I know blogs from south. Sometimes she writes ordinary "grandmother cooking" posts, but other times she lets us know what life is really like under attack. As I write this piece, rockets have been falling for over five hours. Almost every town and city in the south has been hit. From Beer Sheva to Netivot, to Sedrot to Ashdod to Ashkelon and every little town in between has had a siren. In Ashdod an apartment building was hit and a car is on fire. 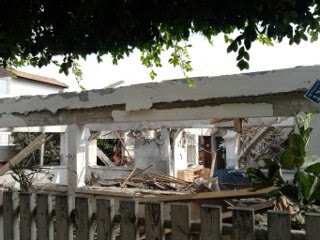 In Ashkelon a private home was hit. In Gan Yavneh a schoolyard was hit. 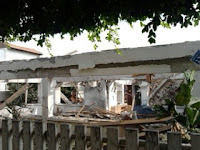 A number of the rockets caused extensive damages to buildings. "My 8 year old is still wandering the house. She is afraid to sleep. She just asked me why the Arabs have gone crazy again? Twice tonight she told me that she hears a siren & ambulances from Netivot. Poor baby! I just sent her downstairs to sleep. She feels safer there." "When the media says no injuries it boils my blood. Many children and elderly like - are suffering emotionally. This is an injury." "Been to busy today trying to calm down a bunch of scared kids. - (8) is the only one that openly admits to being scared. Good for her. - (11.6) is also but will never admit to it. She just asks millions of questions about the grads, injured...and talks non stop. Each kids reacts their own way." "This abnormal situation robs our innocent children of a decent , normal childhood!" "Esther, shavua tov. Are you ok? We were outside eating in the succah ( my hubbie hasn't taken it down yet and I love it...). The siren was soooo loud being outside. It scared the "bleep" out of the kids! The grad in Netivot fell next to you, right? The other one fell here on Givolym. About a minutes walk from my house. "We are fine...do you know where the grads landed...I'm sure your apartment shook.... One was on a moshava 30 secs from Devorah and me the other near a Bnei Akiva snif where the widow of the Baba Sali lives. Yes, right next to the Baba Baruch's house, a 3 minute walk from my home. Even closer than to HIS home it was right near a recently restored shul where my husband was a chazzan for the yomim Noraim." What normal self-respecting country would allow this to continue? Why haven't we totally declared war on the Arab enemy? Why hasn't Israel destroyed the terrorist infrastructure? The Israeli retaliations are just slaps on the wrist. Let's have a better week and a better year. I pray for wisdom for our politicians. May they become leaders!!! I wish this wasn't so close to the truth. Latma's writers get it Right again. 12-Step Guide for the Recovering Obama Voter by Craig Karpel. "My name is Craig K., and I'm an Obamaholic." So begins the mock confession of a former leftist community organizer who woke up with a massive political hangover. Today, many Americans find themselves in the same uncomfortable position. Just as President Obama's uplifting words and bold promises once inspired exaggerated hopes, failed policy after failed policy have left us a nation of recovering Obamaholics. For Americans who wish they had a Latma, they should be happy that they have Craig Karpel's book to read. Mr. Karpel is correct that we’ve become a culture addicted to wishes and dreams, in which celebrity reigns and entertainment is all. The circus is fun, and addiction feels good for a little while. But there may be hope for change. Who wants to be the town drunk forever? Israelis keep offering up vital Land to the Arabs who only want to destroy us, and Americans worship Barack Hussein Obama who... well, must I spell it out? US Republican Paul Ryan charges Administration with having blocked sanctions on Iran for years; Vice President Biden responds: Obama has implemented the most crippling sanctions in the history of sanctions. One thing, besides sarcasm, I try to stay away from when writing and speaking is "absolutes." You have to be very careful when using words like "every," "all," "the most," "never," etc. Exceptions to those "rules," aka absolutes are usually too easy to find. And then when one crack is made in your argument your point is moot, like the bread crumb in the kosher for Passover cake. It's no longer kosher for Passover. There's no "bittul b'shishim." I'm a CPA's daughter, and VP Biden's brag: "the most crippling sanctions," I immediately want the facts, the numbers the details comparing those anti-Iran sanctions to the American ones against Cuba and any other sanctions the US has declared. by Next Summer, Netanyahu Warns U.N.
From what I understand, the strength of the anti-Iran sanctions is that other countries are participating. How much credit really goes to America, and when were these sanctions begun? Now who or what can take credit for that? Is it due to Obama or is it really due to Israeli Prime Minister Binyamin Netanyahu who uses every opportunity to remind the world what a danger Iranian nuclear weapons are to world peace? If you have the facts, please send in the comments. Biden and Obama are most probably coached by the same team. They blame everyone else for problems and take the credit for the good things. Can you believe them? I've not had time to post for a while. However recent events (sirens) have prompted me to find the time. Time is obtained in direct proportion to the importance of the task at hand. It is about 8.00 p.m. right now. That means that in about 2 hours - 10 p.m. or so- we just might have another siren and rockets for the third day in a row. (Cinderella had until midnight. We have until ten.) My husband and I have no 'air raid shelter' room and we aren't scared. At all. It's a fluke of nature I guess. However on Tuesday night we felt differently when a grad exploded near our home not far from the Baba Sali's shrine. (We have the honor of living in the apartment block closest to this holy site.) Our building literally shook. Small children yelled and cried hysterically. We've not witnessed a BOOOM of this magnitude since Cast Lead when a home nearby was totally destroyed. Stop The Sarcasm! They're Trying to Kill Us! !